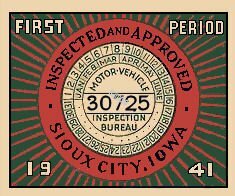 1941 Iowa Inspection sticker - $20.00 : Bob Hoyts Classic Inspection Stickers, Add a Final Touch to your Restoration! This 1941 Iowa Inspection Sticker has been restored and reproduced directly from an original, front and back. We do not know if this sticker was approved for the entire state of Iowa or only the area around Sioux City. It was marked in front as to the expiration date. This one is left blank since it is a nostalgia piece. Buyer could punch out desired month if desired.